Today we have the pleasure of chatting with Johnny and Chris, the masterminds behind Brotherwise Games, and the ridiculously successful Kickstarter campaign for their upcoming game, Boss Monster the Dungeon Building card game. Hey guys, thanks for taking a few minutes to answer some questions for us! For our readers who may not know who you are, could you introduce yourselves and tell us one random fact about yourselves? Johnny: We are Johnny and Chris O’Neal, two brothers who share a lifelong love of all things geeky. Comics, novels, movies, video games… but especially tabletop games. A random fact about me is that I used to write for a video game review Web site called Nintendorks. Chris: As the elder brother I like to take the credit for the nerdification of my younger sibling (although I can’t take all the credit). For years after I went to college we lived in separate states, but a common move to Southern California in 2009 put us within an hour of each other, and reinvigorated our common love of gaming. How did you first get into gaming? What game was your first love? Johnny: Growing up, of course I assumed that everything my big brother did was cool, which included playing D&D with his friends or video games on our family’s TI-994A. But it was our family’s acquisition of a NES and the original Super Mario Bros that really got me hooked. Chris: Being almost a decade older, I was already playing a lot of tabletop games (Morrow Project, anyone?) when the first home video game systems came out. Video games derailed my investment in tabletop games for a while, but after college I got back into them pretty heavily. First love game? Probably D&D. I was one of those kids who would sit around and make character after character that would never see the daylight of an actual adventure. I loved it. 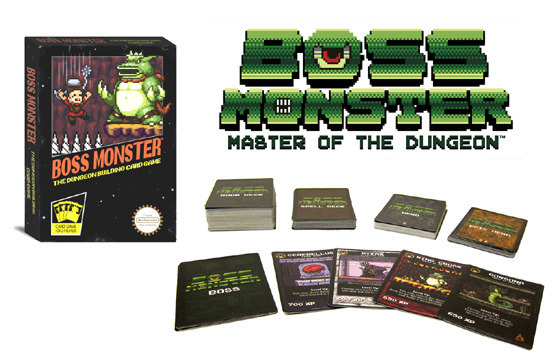 Is Boss Monster your first attempt at releasing a game through Kickstarter? If so how shocked are you at the number of backers the game has received? Chris: Boss Monster is our first Kickstarter. Despite feeling like we had a solid game, a good look and theme, and a decent understanding of how to appeal to our gamer compatriots, I think it’s safe to say that we were pretty overwhelmed by Boss Monster’s success. I think it’s natural to keep your hopes and dreams a bit in check when you do this sort of thing. On launch day I called Johnny at six in the morning and said calmly, “don’t freak out if we don’t hit $1000 this week. We’ve got a month to raise $12,000. Chances are good we can pull this off.” Two hours later I was gibbering into the phone like an overexcited idiot as we passed through $3000. Even once it was clear that the campaign would be successful, we were still underestimating the final amount by a huge amount. Kickstarter is a strange and wondrous beast. Despite what could only be called a huge success, we made a truck-full of mistakes, and learned a number of lessons that we’ll take into our next campaign. So if you would, take us through the creation and design process of the game. It seems to cross multiple genres; how did you put all of that together? Johnny: It was a highly iterative process. In the very beginning, weirdly enough, it was a game about acquiring friends in high school instead of acquiring dead adventurers in a dungeon. When we stopped worrying about what game would be “marketable” and “mainstream,” and focused on making a game that we’d love to play, that’s when it came together. Looks like Pixel Lincoln is making an appearance in Boss Monster; did you approach Jason Tagmire about putting that together, or did he come to you? Johnny: As our Kickstarter campaign went live, we sent preview copies of the game to a number of Web sites. To our surprise, one of these copies was actually passed on to Jason. I’ll admit we were anxious to hear his opinion of the game, and thrilled when we heard he liked it. The crossover cards were his idea, but we embraced the idea wholeheartedly. Pixel Lincoln appears as a promo card for Kickstarter supporters, and it’s a card that can really shake up the game. So what is it like designing games with a sibling? Who usually wins the arguments? Chris: Every game that Brotherwise has in the pipeline has one of the brothers designated as a Lead Designer. The Lead Designer, in theory, wins every argument for that particular game, and we think it’s important to have one person who is ultimately in charge and on the hook for a game’s success. In reality, we’re very good at listening to one another, and relatively unabashed about criticizing work in progress. In almost every situation where we had a disagreement about a key decision, the resulting discussion led us to a good outcome. Johnny: I have to say that Chris is awesome at keeping things positive and never letting discussions turn into arguments. My natural instinct in a game design debate is to stick to my guns and rarely concede a point right away, but often I’ll sleep on a decision and realize that Chris was right. From pointing out that we should use pixel art to removing dice-rolling as a core mechanic of the game, he managed to change my mind in some very important ways. What are some of your favorite board/card games? Chris: I am first and foremost a Heroclix player. I gravitate to complex games and they don’t get much more complex than that one. I’m also a wargamer, with World in Flames as my hands-down favorite. I’ve been playing a lot of Small World recently, and I just marvel at it. It’s my standard for what a quickie game should be: balanced, simple, thematically compelling, and a lot of variation in a small package. Johnny: My favorite recent game is Ascension. I know some of the team at Gary Games and they’re a bunch of geniuses — I can’t wait to play SolForge. I also love the classics: Magic, D&D, and Settlers of Catan. Are there any other games on the horizon you can talk about? Chris: The success of Boss Monster: Master of the Dungeon allowed us to move forward our production time table for expansions considerably. Summer 2013 will see our first Boss Monster mini-expansion, Tools of Hero-Kind, and in Fall we will launch a Kickstarter for our first full expansion, Crash Landing. Tools of Hero-Kind will add a whole layer of complexity to the game, turning our heroes from mere resources into honest threats. Crash Landing will riff on some famous fantasy/sci-fi crossovers and introduce sci-fi themed dungeons to the game. Crash Landing will work as a standalone game or as an expansion of the base game. If you missed out on some of our customize-your-card pledges this time around, we’ll repeat those sorts of pledges for the Crash Landing Kickstarter campaign. 2014 will see the release of our first non-Boss Monster title. We can’t say much about it now except that it’s a totally different genre and will introduce a novel card-play mechanic that comes right out of its theme. Johnny: As a younger brother, I relate to Starscream’s constant efforts to overthrow his superior. Johnny: He-Man. But I’m biased because I had the chance to work on He-Man toys when I was at Mattel. Chris: Gimli, son of Gloin, son of that other dwarf. Johnny: Legolas and his flowing mane of golden locks. Thanks, guys, for talking to us! Make sure you check out Boss Monster, at www.bwisegames.com, pre-order your copy at shop.bwisegames.com and follow Boss Monster on Twitter @BossMonsterGame ! And thank you for reading!